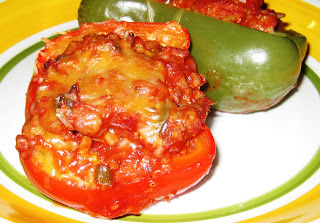 A complete main course meal in stuffed bell peppers! This powerhouse recipe contains ground turkey for lean protein, brown rice for fiber, and veggies for antioxidants. In addition to the health values, this recipe is delicious and easy to put together. I keep red, yellow, and green peppers in stock all the time because I like to use a combination of peppers for this fabulous dish. Plus, I cook these in bulk and then have some for healthy leftovers later. Cut bell peppers in half lengthwise; discard seeds and membranes. Place in a casserole dish - the bottom of the dish should be covered with a thin layer of the spiced tomato sauce. In a pan, add canola oil and sauté the onions until translucent (5-7 minutes). Add minced garlic and cook for 2 minutes. Add the ground turkey and brown. Add Italian seasoning and crushed red pepper to the meat mixture. In a large bowl, combine the cooked ground turkey, brown rice, and diced tomatoes. I like my food on the spicy side so I taste it at this point and add more crushed red pepper if I need to. Scoop mixture into each bell pepper half. Spoon more sauce over the top and sprinkle with light mozzarella cheese (or your light favorite cheese).